Our people in Anambra state will determine IPOB’s next line of action. We don’t want to go to war, we don’t want much of our people to die in this process of restoring our sovereign state which is Biafra unless we are left with no choice than to go to war. Anambra state will determine if IPOB should pick up arms and defend ourselves and our territory- Biafra. IPOB have chosen peaceful option which is civil disobedience, “ELECTION BOYCOTT “. It is now left for the people of Anambra to endorse this peaceful method by totally boycotting Anambra gubernatorial Election 100% or choose the next option which is picking up arms and confronting Nigerian government. 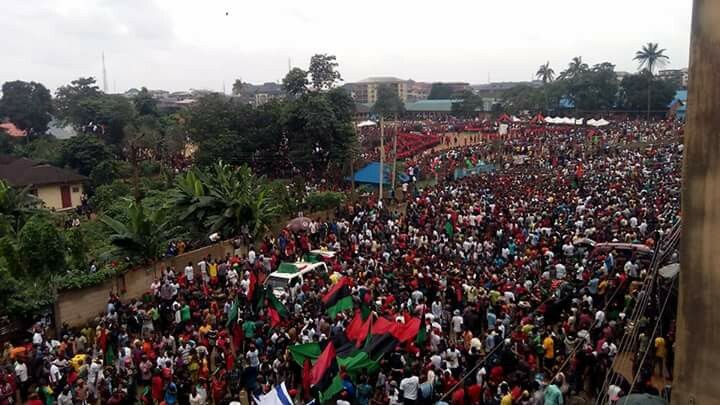 The entire Biafrans are watching Anambra people keenly in this Biafra restoration project, the ball is on their court. Anambra is the first son and should take up the task and mantle of this position by delivering Biafra to Biafrans worldwide.